The 12.4.2010 Help-Portrait event in San Francisco was fantastic. Tons of volunteers stepped up to help out, and over 100 deserving families showed up to have their portrait made. We caught up with this year’s SF Help-Portrait organizer, Joey Chandler, to get the lowdown on all the behind-the-scenes action. We wanted to know how the pre-event planning went and if he had advice for anyone wanting to get involved with (or lead!) an event like this in his/her own community. How did you first learn about Help-Portrait? I heard Jeremy Cowart talk about it at Escalate LIVE in May 2010, and then we did an H-P event in July. Was 12.4.2010 your first time participating with Help-Portrait? It was my first official event on the worldwide H-P day, but I organized a local event in July at a Salvation Army recovery center. How many volunteers and clients were at your SF Help-Portrait event on Dec. 4th? 75 volunteers and 250 people were photographed. How many portraits were given? 100 families/groups received 2 prints each. What is your favorite story that came out of the day? I didn’t meet the family, but I heard of a family with a six-year-old who had never had his picture taken. Pretty cool to think we provided that for him and his family. When did you begin actively planning for the 2010 event in San Francisco? Late October — I had a strong base after our event in July, but I should have started earlier. How did you decide to partner with the Visitation Valley Community Center? We had two partners pull out in November. I sent a semi-panicked email out on a Monday, and Nick Wolff of VVBOOM responded immediately. They had the space and ended up being a great partner. Who helped you organize the event? Did any sponsors help out? I did most of the pre-event organizing, (note to self: ask for help earlier next time), and I asked several people to manage key areas (check-in, set-up, printing, etc.) on the day of the event. Sponsors came through big time. Ritz Camera providing a printer and staff was huge. I’ve mentioned many of our other great sponsors on my blog. I manage the SmugMug User Group in San Francisco. A good number of people came from there. There were also people that participated in the 2009 Help-Portrait event and others that just signed up on the H-P website. What hurdles did you have to overcome? Creating high quality prints — We did this by having Ritz Camera there and also by standardizing the shooting and the workflow. Borrowlenses.com was huge for this and donated five Canon 5D Mark II’s with lenses and four studio setups. That allowed us to remain consistent in image quality no matter who was shooting. Keeping people organized — We used Google Docs to create a schedule for shooting, set up/tear down, printing, sign-in and runners/client escorts. Scheduling clients — Families are always tough to schedule and with this many, there are going to be a good number that don’t show. Next time, we plan to get phone numbers and have a team of people make reminder calls the day before the event. Asking volunteers to help solve problems — Your volunteers aren’t just photographers, all lot of them are small business owners. They all come from various backgrounds and careers and have a wide range of skills. When you run into a problem, ask your team for advice. Everyone genuinely wants to pitch in and help out, and more often than not, you’ll get great feedback. Preparing the partner for the event — Giving the VVCC team a clear understanding of what is possible at this event. Most non-profits are not going to understand how amazing this event is and VVCC was no different. They are thinking it’s just going to be a few people with cameras, so they are blown away when we show up with 75 volunteers, professional lighting setups, and several hundred thousand dollars worth of camera equipment and computers. Hopefully, we’ll work with them again, and we’ll really be able to reach many more people. Besides photographers, what other volunteer roles are needed at Help-Portrait events? Is there anything you would do differently when planning future events? What would you improve? Identify team leaders as soon as possible. Have a sourcing team — They work with the partner to make sure we have lots of clients. My goal is to have the photographer leave exhausted from shooting all day. Clear requirements/expectations for each role — For example, to be on the printing team, you must know Lightroom 3. Work with printers ahead of time so we can get super clear, colorful, sharp photos. I want the final product to be the same level that we hand our standard clients. Sign/decoration team — We’d like to give the event the feel of a high-end boutique. Cloth backdrops — We’d like something more interesting than paper. Provide each family with 2 prints and a CD. What advice would you give to someone who is interested in organizing a Help-Portrait event in their own community? Go BIG. People will show up for this. Find a partner that will deliver more clients than you can handle, and go for it. When communicating with a potential partner, I highly recommend pointing them to the summary video on Help-Portrait.com. This is the best way to explain H-P and get people on board. Do a test run in the summer. That will help everyone get on board for December. Makeup artists are crucial — almost more important than the photographer — so, don’t leave that until the last minute. (We partnered with the W Institute of Cosmetology, and they made a huge difference). Approach the printing like a standard workflow. Think about what you want to deliver to the clients and what you need to make that happen. What inspires and motivates you to volunteer? I do this in part because it’s such an amazing idea (huge props to Jeremy for this), and I love seeing the difference it makes for clients and photographers alike when that client gets a great photo for themselves. But I also did this to meet other photographers. I’ve only been in business a year, so I was looking for a way to connect with and learn from other photographers. After doing two of these in 6 months, I now have relationships with a whole slew of amazing photographers. We’ve worked together, and that creates a bond that is much deeper than seeing someone at classes or other meet-ups. I’ve learned from them and feel like I can ask them just about anything. Plus, I’ve gained confidence by taking the plunge and leading the team. I don’t think I would have had that without doing these events. Joey Chandler is a San Francisco portrait and wedding photographer. His motto is “People. Play. Portraits.” and believes the best photos are created when clients (and the photographer) are relaxed and having fun. Joey is entering his second year of business after shooting over 150 portrait and family sessions in 2010. He has organized two Help-Portrait events in San Francisco and manages the San Francisco SmugMug User Group — a monthly meeting of amateur and professional photographers. 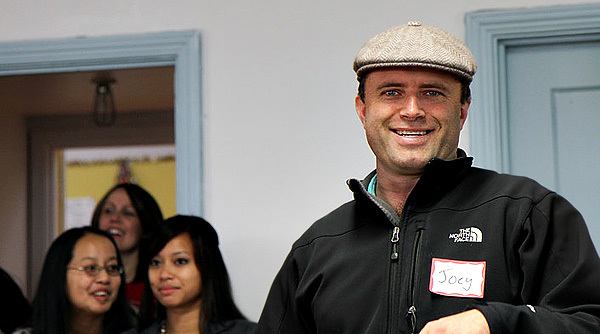 Joey lives in San Francisco with his wife and three-year-old son. Founded by Celebrity Photographer Jeremy Cowart, Help-Portrait is a community of photographers, coming together across the world to use their photography skills to give back to their local community. To learn more, check out their site at www.help-portrait.com and visit their charity detail page here on Shutter Mission.